Rabbit Supplies at Petwerks:EZ Crock COLORS !!! This is a 20 ounce feeder that clips to the side on the pet home with ease. Works great as a water bowl too since your pet can't remove it and spill the water everywhere! No having to unscrew a tight nut to get the bowl off, simply remove the wedge and the bowl comes right off. Just toss it in the dishwasher or hand wash for easy cleaning. These are not made of the same ABS plastic as the FD005/FD006 gray bowls. 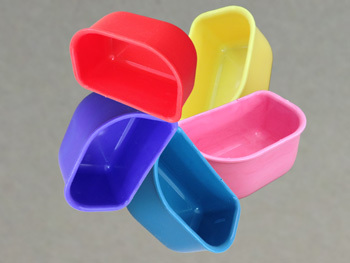 These are RECYCLED PLASTIC so they are not only great for your bunny's environment, but for the Earth too! Limited to colors and quantities on hand as each batch made will have different colors...so get your favorite colors now! We will make every attempt to honor color requests whenever possible, otherwise we will send you one of the lovely colors we have in stock.